Art by the ineffable Kit Buss. Thanks to Matthew Mercer for providing the full character sheet here. If there was any doubt, Beholders are nasty business. Each round, they have three eye ray attacks (list in character sheet), as well as an additional three ray attacks spread after three different foes’ turns as legendary actions. Their Antimagic Cone from their main eye (as we saw from Tiberius’s frustration) prevents spells and magical items from taking effect within it, but would need to be turned off for the round should the beholder wish to use their rays through this area. Beholders also have lair actions, including, as we saw, an eye ray randomly generating on a solid surface, granting ANOTHER eye ray attack. K’Varn, however, was in a whole other league, thanks to his experimentation. The armor grafted to him increased his AC to 19. The stitch monsters added another wrinkle to the fight, made all the worse by bad rolls from Pike and Grog. The real danger, of course, came from the Horn of Orcus. He automatically healed 30 HP each round it was attached while he still lived, and foes he knocked unconscious healed him an additional 15 HP (as well as auto-failing their first death save). Worst of all, Orcus’s Blessing used K’Varn corpse for its own purposes as an undead, extending the battle, although K’Varn was far less strategic in this form. Fortunately, it did not take much to bring him down yet again, and Tiberius was able to quickly remove the Horn before the battle could be extended again. With all these enhancements in place, Vox Machina did a LOT right this fight. Percy’s Headshot (which has since been nerfed) was the real winner in this fight, granting advantage on saves on the majority of K’Varn’s attacks. Pike’s Death Ward also provided Grog an extra round of life, wasting one of K’Varn’s brutal attacks to take out the goliath. Vox Machina’s positioning also provided a significant advantage. Beholders often take advantage of their hovering capabilities, staying out of range of grounded melee combatants and keeping casters in view of their anti-magic eye. 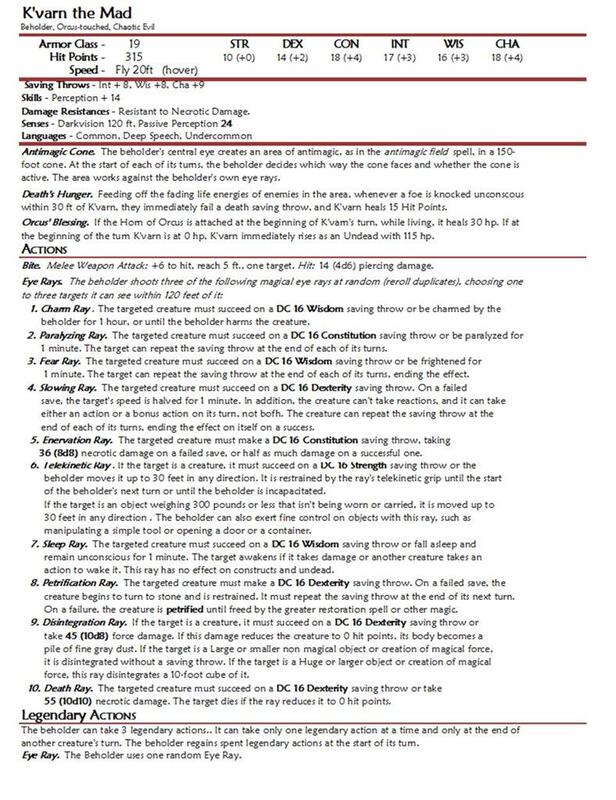 Because Vox Machina took position from both the ceiling and the floor, K’Varn was unable to focus his attacks on the party and unable to use his elevation to escape damage, in turn.